We collected signatures. Children wrote letters which were sent to war fronts, in which they requested the release of a local politician and rejected violence. What bothered the guerrillas the most was that civil society complained about his kidnapping, that we organized marches against it. Moreover, we made shirts with his picture. The guerrillas did not like it because it was pressuring them. They were not keen on civil society making so many public statements because they were losing credibility. The pressure really made them free him, since keeping him hostage was representing a political loss. - Interview with a resident of Samaniego, Colombia, 2014; translated, edited slightly for clarity. As this testimony illustrates, civil resistance isn’t always about masses of people in the streets calling for the downfall of authoritarian regimes. At this moment, in many countries around the world, unarmed civilians living in warzones are resisting armed groups in surprising and subtle ways. They are refusing to sell goods to soldiers and paramilitaries, constructing community-run schools and other institutions to decrease dependence on the government and other armed groups for survival, and much more. And in many cases, these nonviolent actions are shaping armed groups’ behavior in big and small ways that complement peacebuilding efforts (Hallward et al 2017, Kaplan 2017). This is more common than many may expect. The history of nonviolent resistance is long but often hidden (Bartkowski 2013). However, in the last few years civil resistance campaigns in settings of violent conflict have been increasingly documented in countries including Colombia, Indonesia, the Democratic Republic of Congo, Sudan, Turkey, Yemen, Israel-Palestine, Syria, Iraq, Nepal and Thailand. As we have gotten deeper into this new research frontier, we’ve made some observations about various aspects of nonviolent resistance in contexts of armed conflict that are worth sharing with others working and studying in this field. While we often think of the state as the opponent, civil resistance campaigns in civil wars often target non-state armed actors, as these frequently become de facto agents of repression and rule. Campaigns may target only one actor, such as when one armed organization is the sole ruler in a given area (Arjona 2015). But they may also target multiple groups simultaneously. Where territorial control is at stake, actors may resist all armed groups, regardless of which side of the conflict they are on (Masullo 2015). In the municipality of Samaniego, Colombia (in reference to the opening quote in this post), civilians have opposed guerrillas as well as paramilitaries and state armed forces. They have done so notably through openly protesting practices of which they disapprove (such as civilian kidnapping) and refusing to provide food, shelter, and intelligence to armed groups (Mouly et al 2016). Civil resistance scholars often study large-scale manifestations of dissent, like marches and demonstrations, but campaigns in the context of war commonly take more subtle and oblique forms. In fact, coordinated expressions of what James Scott has termed “everyday forms of resistance” tend to be more prevalent than mass protest and large public displays of dissent: for example, Palestinians farming their own fields in an area under Israeli occupation or Kurds organizing local native language schools where the Turkish national education system overlooks minority identities (Seidel and Koefoed forthcoming). Rather than striving for maximalist objectives such as regime change, ending foreign occupation and/or secession, civilians engaged in campaigns in conflict settings often seek more micro and localized goals—ones that put a human face on civil resistance. Such goals include protection from violence, avoiding displacement, regaining some autonomy vis-à-vis rebel rulers, and maintaining or fostering community cohesion. In war-affected communities these goals are often related to survival needs and can pave the way for successful peacebuilding in the longer term. Research on civil resistance in the context of armed conflict is not likely to be captured by the country-level data often used in recent research in the civil resistance field (e.g., NAVCO dataset). The types of campaigns we study commonly emerge in response to localized war dynamics. They remain local in scope and tend to be independent of the macro-level dynamics that give rise to war. As a result, most of the evidence we use is subnational, draws from detailed case studies and within-country comparisons, and is collected in the field. Many studies examining civil resistance against authoritarian regimes have pointed to democratization as the main legacy of these campaigns (see, e.g., Maciej Bartkowski’s recent blog). In the context of war, civil resistance may also leave communities better equipped for engaging in peacebuilding and post-conflict reconstruction efforts. For example, by collectively engaging in forms of pacted noncooperation against armed organizations during war, civilians in two communities in Colombia have facilitated the social reintegration of ex-combatants (Mouly et al 2017). Similarly, by forging a new generation of community leadership, a nonviolent campaign of oblique noncooperation in another Colombian locality created conditions for community engagement in critical reconstruction tasks such as assisting the return of displaced populations or finding the disappeared (Masullo forthcoming). Check out the references and further reading list below if you’re interested in reading more about the cases cited here. Eight years after the publication of Why Civil Resistance Works by Chenoweth and Stephan, the field has expanded its original focus on toppling oppressive regimes, and currently considers a broader variety of threats, including corruption and environmental damage. With this wider lens, recent work on civil resistance in the context of civil war is capturing new aspects, both substantive and methodological, that were previously ignored or neglected. And we hope that sharing these insights will stimulate further and deeper reflection in this intellectually fertile and politically relevant field of inquiry. Arjona, Ana. “Civilian Resistance to Rebel Governance.” In Rebel Governance, edited by Ana Arjona, Nelson Kasfir, and Zachariah Cherian Mampilly, 180–202. Cambridge: Cambridge University Press, 2015. Bartkowski, Maciej. Recovering Nonviolent History: Civil Resistance in Liberation Struggles. Boulder, CO: Lynne Rienner, 2013. Chenoweth, Erica and Maria J. Stephan. Why Civil Resistance Works: The Strategic Logic of Nonviolent Conflict. New York, NY: Columbia University Press, 2011. Hallward, Maia, Juan Masullo and Cécile Mouly. “Civil Resistance in Contexts of Armed Conflict”, Journal of Peacebuilding and Development (Vol. 12, No. 3), 2017. Click here for more information. Kaplan, Oliver. Resisting War: How Communities Protect Themselves. Cambridge: Cambridge University Press, 2017. Koefoed, Minoo. “Constructive Resistance in Northern Kurdistan: Exploring the Peace, Development and Resistance Nexus”. Journal of Peacebuilding and Development (forthcoming in December 2017). Masullo, Juan. “A Theory of Civilian Noncooperation with Armed Groups: Civilian Agency and Self-Protection in the Colombian Civil War.” Doctoral Dissertation, European University Institute, 2017. Masullo, Juan. “Civilian Noncooperation as a Source of Legitimacy. Innovative Youth Reactions in the Face of Local Violence.” In Local Peace Building and Legitimacy, edited by Christopher R. Mitchell and Landon E. Hancock. London: Routledge, forthcoming in early 2018. Masullo, Juan. The Power of Staying Put: Nonviolent Resistance to Armed Groups in Colombia. ICNC Monograph Series, 2015. Download PDF. Mouly, Cécile, Esperanza Hernandez Delgado, and Jaime Gimenez. “Social Reintegration of Former Combatants in Two Colombian Peace Communities.” In 58th Annual Convention of the International Studies Association (ISA). Baltimore, 2017. Seidel, Timothy. “‘We Refuse To Be Enemies’: Political Geographies of Violence and Resistance in Palestine”. Journal of Peacebuilding and Development (forthcoming in December 2017). Featured photo: "We too have the key to peace." Carare River, Colombia. Credit: Juan Masullo (image edited). 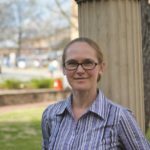 Maia Carter Hallward, Ph.D., is a Professor of Middle East Politics in the School of Conflict Management, Peacebuilding and Development at Kennesaw State University and Executive Editor of the Journal of Peacebuilding and Development. She has published four books and over a dozen peer-reviewed articles on peacebuilding and activism. 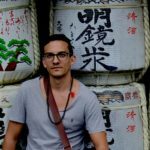 Juan Masullo, Ph.D. (European University Institute), is a Post-Doctoral Fellow at the Bremen International Graduate School of the Social Sciences. His academic interests include civil wars, collective action, civil resistance and, more broadly, contentious politics. Previously, in 2016-17, Juan was a Research Fellow at Yale University’s Program on Order, Conflict and Violence. 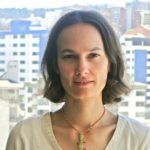 Cécile Mouly is a research professor specializing in peace and conflict studies at the Facultad Latinoamericana de Ciencias Sociales (FLACSO) Ecuador. She holds a Ph.D. in International Studies from Cambridge University. Her research interests include civil resistance in the context of armed conflicts and the role of civil society in peacebuilding.